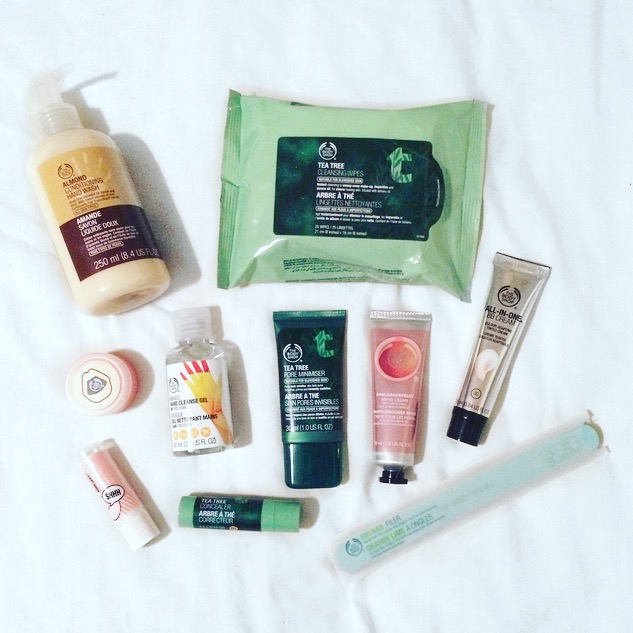 A couple of weeks ago now The Body Shop were doing an offer that was just too good not to take advantage of, the offer this time was if you spent over £50.00 you could get £25.00 off of your end total, which I personally think is brilliant. So me being me decided to take full advantage of this offer and went on a little online shopping spree, some of the stuff I ordered I had already tried before but some of the other stuff was all new to me. I will list below with what I got and also what I thought about each product, all titles of each product will also be links to the exact products on The Body Shop website. Tea Tree Cleansing Wipes: I can be quite lazy at times when it comes to washing my face of a night time especially if I'm really tired. These face wipes smell really nice and are really refreshing aswell whilst removing all traces of everything on your face, I also find the tea tree in them helps to calm any blemishes that may be starting to make an appearance. Tea Tree Pore Minimiser: How have I never tried this stuff before now?! This applys really nice and has a lovely matt finish to it, whilst really helping to minimise your pores without feeling like you've got stuff on your face. I apply this after I've applied my moisturiser and I love this stuff and wouldn't be without it now, it also helps stop any shiny patches from appearing through the BB Cream that I use. Tea Tree Concealer: Again I had never used this product before now but thought I would give it a try as I do love the tea tree range that The Body Shop do, Just recently I had quite a few breakouts on my chin and this really helped to cover them up if they started to look a bit red. I also think the tea tree in this has helped to clear them up a lot quicker then they usually would of. Nail Files: Now being a nail technician I never thought Id see the day where I run out of nail files for myself haha! But I did, I just have no idea where all mine went so these were just an essential top up for me. Lychee Lip Balm: I brought this just for the fact that it said it "moisturises and conditions lips" and all I will say is its the worst product ever! Its got a really horrible shimmer to it and kinda reminds me of one of those lip balms you would use when you was little! Definitely not one that I would use now at 29, Infact I ended up giving this one to my 12 year old niece as i wasn't ever gonna use it again. Pink Grapefruit Handcream: Again being a nail technician I love any kind of handcreams that are gonna keep my hands looking and feeling soft throughout the day, and at just £4.00 these handcreams are a bargain. Almond Hand Wash: I was on the lookout for a new handwash as I was getting bored of the one I was using, so I decided to try this one out as I love the almond smell and the colour also really remind me of the Autumn season for some reason. Mango Hand Cleanse Gel: Everyone needs a hand cleansing gel for those times you are out and aren't able to get to a sink to wash your hands clean of any germs you may have picked up from touching stuff whilst you've been out. This makes your hands feel clean and the mango scent is gorgeous, if you hadn't already figured out from this handcream post I love anything that smells of Mango. All-In-One BB Cream: As much as i love my Body Shop Tea Tree BB Cream, I decided to give this one a try. I got this in the colour light and at first thought it might be a bit too light but then I noticed it said "tinted" on the packaging and it tints itself to the right colour to match your skin tone. Although at £12.00 I do think this is a bit too expensive for how much you get in the tube, saying that though I probably will purchase this again at some point in the future.